Udupi, Sep 17, 2014: Sri Krishna temple celebrated Sri Krishna Jayanti with pomp and grandeur, as Paryaya Kaniyur mutt seer Vidyavallabhatheertha Swamiji performed ‘Arghya Pradhana’ ritual amid religious hymns, bhajans and discourses. The seer performed Arghya Pradhana at 12.36 am to the Lord inside the sanctum sanctorum. Prior to that, the seer performed ‘Tulasi Archana’ to Lord Krishna at 10.30, who was decorated in the form of kneel down Krishna, as a newborn child. Earlier in the day, the Lord was decorated with diamond amour. The ritual of ‘Mahapooja’ followed Arghya Pradhana. The seer later performed Tulasi Archana to Tulasi Vrindavana. He also offered Mahapooja and Arghya Pradhana to Tulasi Vrindavana, following which the devotees were allowed to perform Arghya Pradhana ritual to the Lord outside the sanctum sanctorum. Hordes of devotees : Devotees were seen in long queue waiting to catch a glimpse of Lord Krishna. They thronged the temple in large numbers to offer prayers to Lord Krishna. The temple was decorated with varieties of flowers right from the entrance to all the entries leading towards sanctum sanctorum. The Bhajan troupes recited Bhajans nonstop from morning 10, until the auspicious hour of Arghya Pradhana. The day was also marked by avariety of cultural programmes, various competitions were held on the occasion at Rajangana. Muddu Krishna and Rangoli competitions were also held. Vittlapindi today Sept 17 : The Paryaya seer will offer morning pooja at 5.30 am on Sept 17 and prasadam will be offered to the devotees at 8.30 am. As many as one lakh ladoos and one and half lakh chakkulis are prepared to offer to the devotees on the occasion. 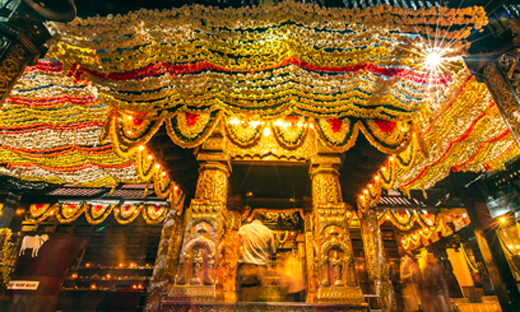 The Kankadasa idol in front of Krishna mutt will be offered ‘Silver Kavacha’ at 10 am. Following which the “Sri Krishna Leelotsava” or “Vittlapindi” or “Mosarukudike habba’ will begin at car street at 3 pm. Many celebrations are expected.